"Everything is there in the Bhagavad-gita for guidance if we accept the philosophy of Bhagavad-gita as it is. Everything is there. Peace is there, prosperity is there. So that is a fact. Unfortunately, we do not accept it. That is our misfortune. Or we misinterpret it. Krishna says in the Bhagavad-gita, man-mana bhava mad-bhakto mad-yaji mam namaskuru. Krishna says that 'You always think of Me,' man-mana bhava mad-bhakto. 'Become My devotee.' Mad-yaji, 'You worship Me.' Mam namaskuru, 'And offer obeisances unto Me.' Is it very difficult task? Here is Krishna's Deity. 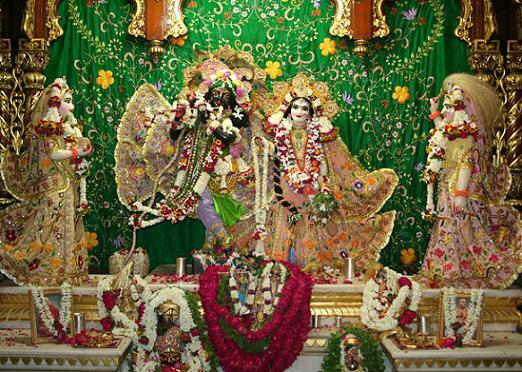 If you think of this Deity, Radha-Krishna, is it very difficult? Man-mana. You come into the temple and, just as a devotee, offer your respect to the Deity, man-mana bhava mad-bhakto. As far as possible try to worship the Deity, patram puspam phalam toyam yo me bhaktya prayacchati. Krishna does not want your whole property. Krishna is open to the poorest man for being worshiped. What He is asking? He says, patram puspam phalam toyam yo me bhaktya prayacchati: 'With devotion, if a person offers Me a little leaf, a little fruit, a little water, I accept it.' Krishna is not hungry, but Krishna wants to make you devotee. That is the main point. Yo me bhaktya prayacchati. That is the main principle. If you offer Krishna little things... Krishna is not hungry; Krishna is providing food for everyone. Eko yo bahunam vidadhati kaman. But Krishna wants your love, your devotion. Therefore He is begging little patram puspam phalam toyam. Man-mana bhava mad-bhakto. There is no difficulty in understanding Krishna and to accept Krishna consciousness. "